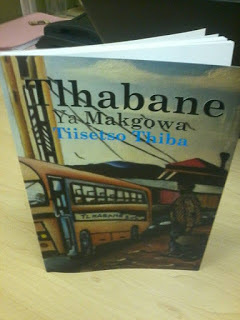 The author, South African fluent poet, Thiba wrote this book based on what is happening in the real life. And he takes us step by step through the life of hamlet lad Modisagaarekwe; who was born in one of the village called Phaposane near Ganyesa in North West Province. Modisagaarekwe was a young man who was collected, meek and very responsible from a tender age. And his parents raised him well that is why when he started working, and when he visited home, he was always handful. Because he used to come home with groceries and clothes for his parents from Gauteng where he was working in a post office, and that never changed when he got a lucrative job at Impala Mine in Rusternburg. Neighbours were pleased to see what this young man is doing for his parents, and they wished their boys could do the same as Modisagaarekwe. Furthermore those neighbours were so hopeful that this lad will marry one of their beautiful daughters from his village soon. And things turned nasty when he went out and married drop dead gorgeous Gadifele from Gamanyai, just a few kilometres from Phaposane. After his cultural marriage in Phaposane when he greeted his neighbour none of them greeted him back, they were so jealous and full of loathing, wondering what does Gadifele has that their daughters don’t have. The title of the book is a nick name of the Platinum city Rustenburg. Most of the guys who work in Rustenburg, when they visit their homes, wives and kids and parents, they used wear nice clothes and smell nice. And those unemployed guys back at home they were disliking them because they were getting lots of love from the ladies in the villages because they will always be cleaned, wearing flasham shoes, brandwood trousers, white shirt, and leather jacket when the weather is unfriendly cold while their fishtale cuts full of glycerine and when they pass the streets, others will call them “Makgowa” meaning a person who got money and style. Modisagaarekwe was maturing very well and his parents were very proud of him, because swiftly they were blessed enough and had two sons with his wife Gadifele. While working in Rustenburg he got attracted to a cute lady called Kedisaletse. And Kedisaletse stolen Modisagaarekwe’s heart and managed to make him forgot his parents, his wife and sons. Though he promised his uncle Thulo that he will never change when he got to Rustenburg because he knows what he wants in life. Rustenburg girl Kedisaletse used muthi to make Modisagaarekwe to love her and buy her a house full of furniture, and a car. Take care of her daughter of not his. And make him marry her to take all his money from Impala and his assets as well. Kedisaletse managed this by help of her mother and sister, none of them were not married but they own a big house with the same trick they used to trap guys most especially from villages and makes them forget where are they coming from. Most of the ladies in Tlhabane Ya Makgowa apply that trick for guys and win their hearts and pretend to love them though they are in a mission to fulfil it. And you will be surprised to see young lady driving a German machine and she is single, though others are more educated and use their education to succeed in life with or without boyfriend or marriage. Modisagarekwe went back home with nothing after fulfil Kedisaletse’s mission and they had only one child together beside first born of Kedisaletse. He was forced out in his big house by police after Kedisaletse allegedly claimed that he had raped her, and after few days Modisagaarekwe spent in Jail her Rustenburg wife decided to drop the charges and asked the police to release him and never allow him to come closer to their house in Tlhabane as it was final that they are divorced. He arrived home in Phaposane with nothing to show that he ever worked a lucrative job. He was tattered like a web spider and smelly like a pig kraal. It was a shame and he was accepted back by his family and both his parents were late because of his unpleasant deeds and shame he put in his family. Gadifele and her sons never allowed their father to live with them again fearing the deceases and embarrassment. Modisagaarekwe sons were so successful in life. Modisagarekwe was regretting everything that happened in Rustenburg and wished he could be dead at once because he was now the laughing stock of the village, no longer smelling nice and dressing fine clothes like he used to be. What a pity!! Thank you very much Malome Bolaji. Hahaha this really means a lot to me. Modisagaarekwe o bone dilo Le bo mmatsone. Nkgonne Thato, ke nnete monna yo o bone dinta di fuduga. Ke a leboga Morwarre. Thank you very much Henry, much appreciated. Thank you for showing interest in the novel. Please send me your physical address or postal address to this email including your full names. tmthiba@gmail.com ke a leboga.